Two Edinburgh Fringe Shows in a two hour concert. 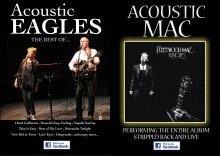 Stripped back interpretations of the classic songs of Fleetwood Mac’s Rumours album in its entirety … plus the best of The Eagles: sweet tight vocal harmonies,percussive guitar with great arrangements – don’t miss it! One guitar, two voices totally live… performing the timeless songs Take it easy, Desperado, Peaceful Easy Feeling, New Kid In Town, Lying Eyes. Gus played with the Eagles lead guitarist Don Felder over a two year period as his bassist and singer in 2006. Hotel California was the song that was created by Don Felder…. Not to be missed. Enjoy the show!